The Latta Bridge Grand Opening May 28, 1952 with Mr. Roxborough, W. Everard Evans, A. A. Campbell, Mrs. T. H. Field (seated), Emily Latta (front), William Hawrelack, Mrs. A Teviotdale, Mrs. M. Williams. Plaque reads "City of Edmonton Archives & Landmarks Committee Latta Bridge named in Honor of David Gilliland Latta, Pioneer Edmonton Businessman 1897-1948, Alderman 2nd Council 1908." Image courtesy of the City of Edmonton Archives EA-10-309. As you approach the bridge from the east, on the south side you will catch a glimpse of a tall green light standard from another era. It is reminiscent of six elegant light standards which attractively punctuated the length of the bridge, but are no longer there. This bridge is the second one built over this ravine. The first bridge was a wooden trestle construction completed in 1911, called “Latta’s Bridge”. At that time the only building close by was Mr. Latta’s brick home located west of the bridge. The trestle bridge was replaced by the present concrete and steel bridge in 1936, and was then called “The Latta Ravine Bridge”, although no city maps designated it as such. View of the Latta Bridge with Simmons Boy and Latta Farm visible in the background. Not the wooden structure of the bridge circa 1927. Image courtesy of the City of Edmonton Archives EA-302-9. The Latta Ravine and Latta Bridge at Jasper Avenue and 91 Street are named after David Gilliland Latta (1869-1948), a pioneer Edmonton businessman. He was born in Ireland and came to Canada in 1889. Latta was a member of the Royal North West Mounted Police, stationed in Battleford. He was passing through Edmonton on his way to the Klondike gold rush in 1897, but decided to stay due to the demand for his blacksmithing skills. In 1902 he opened a blacksmith shop with a partner, and in 1906 was elected as an alderman on Edmonton’s second city council. After two partnerships ended in 1923, Mr. Latta formed D.G. Latta Co. Ltd. The firm specialized in blacksmithing, carriage painting, wrought ironwork, and woodwork for wagons and sleighs. In 1914-15 when war broke out, the company became a wholesale house of iron and steel, heavy hardware, mine, mill, blacksmith, machine shop and welding supplies. The company’s various locations were centered around 97th and 98th Streets, and 101st and 102nd Avenues. Latta’s son William managed the company in later years. In 1907 Mr. Latta built a 2 1/2 story brick house next to the bridge on Jasper and 91st street, with a spectacular view of the Saskatchewan River. The Lattas raised ten children there at 9131 Jasper Ave. The house stood alone for several decades overlooking the Fraser Flats and was known as a local landmark. In 1906 a penitentiary was built five blocks north of the Latta Bridge. A coal mine was established in 1910 by the Alberta Government not far from the Latta bridge, and a mine shaft was located underneath the Latta house. Convicts worked the mine as part of their incarceration. They dug a coal seam 30 metres under Jasper Avenue for nine years, tunneling and blasting northward toward the penitentiary from Jasper Ave. This activity caused soil subsidence and damage to the bridge footings and to several houses along the hillside above the mine, including the Latta house, resulting in cracked plaster and shattered windows. After community league and citizen complaints, and a lawsuit from David Latta, the mine was closed down in 1920. Despite the closing of the “Penn” mine, coal extraction in the area continued. During 1923 and 1924, coal was still being extracted from the area below the Latta bridge trestle, and considerable subsidence resulted. In 1928 the city tried to fill in the ravine to do away with the bridge, but the coal mine shaft deep below the ravine itself was caving in, affecting the foundations. At one point the surface below the wooden bridge dropped two and a half feet. This subsidence stabilized in the 1930s but foundation loads had to be as light as possible. The City Engineer A.W. Haddow said that a steel bridge gave more stability than filling in the ravine because of the movement of the earth. Some bad slides occurred, and because the Sewage Disposal Plant No. 1 was situated at the foot of the ravine, no further filling could be done. To add to these bridge problems, the original wooden timber bridge was only 21 feet wide and did not line up with the road, creating a traffic hazard. The streetcar line to Highlands ran along Jasper, but the cars couldn’t cross this wooden bridge, so the track was permanently detoured north in 1931. By 1936, people were frustrated with the small wooden bridge, but there was not much money to build a new bridge during the Depression. To save money, the City Engineering Department used left over steel members put in storage from a 1931 alteration to the High Level Bridge. Seventy tons of excess girders were used in the new Latta Bridge, an early example of recycling of industrial materials. Seven of the nine main girders were salvaged. They were altered at a storage site and hauled to the bridge by tractor. Scrap streetcar rails were also used to reinforce all mats in pedestals. The City of Edmonton demolished and removed the existing timber bridge, and the Dominion Bridge Company of Winnipeg received the contract for construction. Fabrication took place in Winnipeg, Calgary, and Edmonton. The Latta Bridge circa 1939. Image courtesy of the City of Edmonton Archives EA-75-880. All steel in the substructure was painted a grey colour, described as “a very pleasing appearance”. The hand rails and light standards were finished in aluminum paint. Because streetcars were already re-routed, no streetcar tracks were laid down on the new bridge, making it better for motorists. The bridge was ready and opened for traffic by June 20th 1936. City of Edmonton Archives [Photo EA-302-90], shows the bridge with motor cars travelling across it, with David Latta himself observing the scene, dated c. 1940. Because the bridge was built during the depression, there were specific hiring and labour rules at the time. In order to distribute the work and relieve unemployment, only the timekeeper and the foreman were continuously employed. Labour rates in those days ranged from 48 cents an hour for unskilled labour to 87 cents an hour for teamsters and the team. Labourers and tradesmen were limited to earning $75 and $100 respectively, for this project. The total cost of the steel bridge was $44,000. Lighting was connected to the ordinary street lighting circuit. Six standards were placed on the fence, each with a large globe of standard refractor glassware fifteen feet above the roadway. Cables were connected under the deck. The result was aesthetically pleasing and effective lighting. 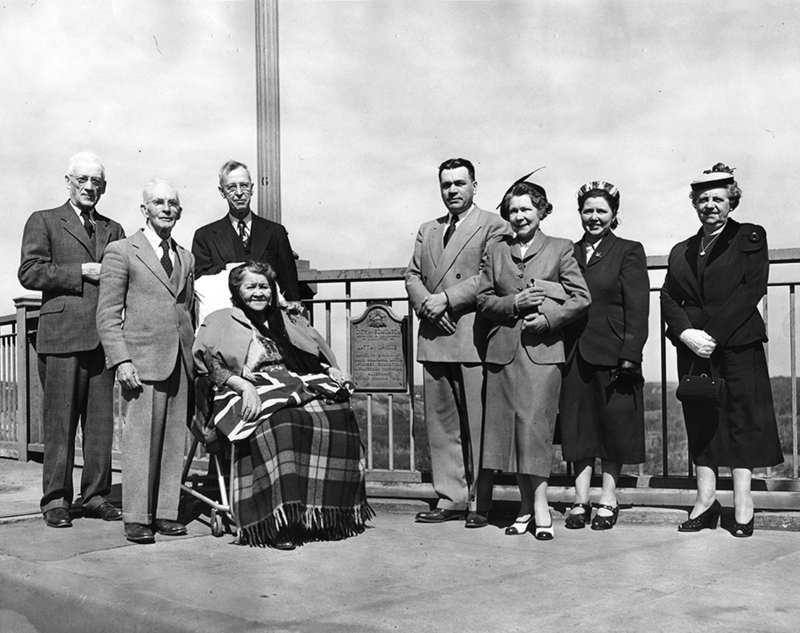 The opening of the bridge was celebrated in June 1936 with a bridge dance sponsored by the Edmonton Elks club. The bridge was actually opened shortly after midnight when the dance was over. The bridge deck was decorated with coloured lights, flags and bunting. At one time it was called the Elks Bridge because the Elks hall was near there, but it was mostly known as the Latta Ravine Bridge. A photo of happy party goers at the end of the bridge can be seen in a June 22, 1936 edition of the Edmonton Bulletin. In 1952 there was a ceremony on the Latta bridge to erect a plaque commemorating Mr. Latta, who died November 11, 1948. All surviving members of his family attended, including Mrs. Emily Latta. The photo which features Mrs. Latta commemorating the bridge, gives us a close up view of how the light standards were built onto the upright rails of the bridge. Emily Latta, Mr. Latta’s second wife, still lived in the house in the early 1950s. It may have been converted to apartments after 1954, but the house is said to have been demolished in 1986, At present there is a private green space next to an apartment building on the Latta house site. Sometime after 2002, the bridge was rehabilitated by the City of Edmonton, and is now a black colour. J. Daryl Sturroch Oct. 16, 1951, “David Gilliland Latta” CEA files. Jessie Daryl Sturroch was D.G. Latta’s daughter. J. Daryl Sturroch Oct. 16, 1951, “David Gilliland Latta” CEA files. “City Lights: Say Hello to the Latta Bridge” by Alex Mair, Real Estate Weekly June 18-24, 1987. CEA files. “Latta Ravine Bridge Opened Early Sunday” Edmonton Bulletin, June 22, 1936, and Photo EA-75-842: view of Latta bridge looking west 1936, and Photo EA-75-880: Latta Bridge, c. 1939, Engineer’s Department. (Large house not Latta’s). Shows side view and under the bridge. City of Edmonton Archives (CEA). Latta Ravine Bridge Edmonton, R5 March 31, 1937. City of Edmonton Clipping files – Engineering – Bridges – Latta Bridge. CEA. Latta Ravine Bridge Edmonton, R5 March 31, 1937. City of Edmonton Clipping files – Engineering – Bridges – Latta Bridge, and Photo EA-75-842: view of Latta bridge looking west 1936. CEA. Latta Ravine Bridge Edmonton, R5 March 31, 1937. City of Edmonton Archives and Landmarks Committee Letter Re: History of Mr. Latta and plaque inscription for Latta Bridge, c. 1952. “A Brief History of D.G. Latta and D.G. Latta Ltd.” 1977. Alex Latta Jr. in MS 60 A77-26. Henderson’s Directory for Edmonton, 1907 to 1959. City of Edmonton Archives. MacGregor, J.G. 1967 Edmonton: A History. M.G. Hurtig Publishers, Edmonton.